Since 1985, FraJon has been manufacturing quality Air Admittance Valves (AAV’s) for the plumbing industry use in commercial, residential and industrial buildings. AAV’s provide a device to allow buildings internal air to enter terminals of drainage, waste and ventilation (DWV) systems, serving multiple fixtures on stack, branch or individual plumbing systems. 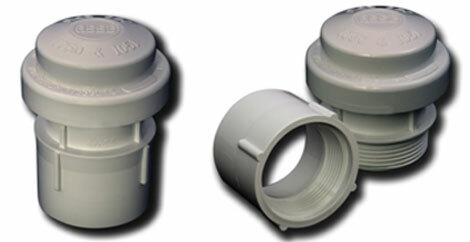 A minimum of one open vent shall extent to outdoor air for every plumbing drain. The AAV seals by gravity under zero differential pressure (static or no flow conditions). Under positive pressure the AAV is a one-way valve that seals to prevent sewer gasses or water from exiting the AAV terminal when pressure less than atmospheric develops. The AAV is an anti-siphon valve that quickly opens before the waterseal of the trap can be broken by negative vacuum (suction). AAVs reduce the number of roof penetrations which decrease the cost of construction with labor and materials. AAV’s provides architects and engineers with more options for layout and design. Call or Email us today for information on our latest promotions. Copyright © 2019 FraJon Valves, Inc.